Should You Include the End in a Movie Synopsis? An early step in selling a movie script you’ve written is often to send a brief synopsis of the script to a reader. If the reader likes your synopsis, he or she may ask you to send the entire script. It’s a big mistake to give away the ending of your movie in your synopsis. Here’s why I strongly disagree with both advisers. The purpose of a script synopsis is not to make a reader’s life easier. 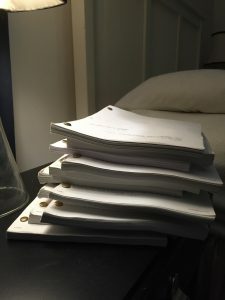 The purpose of a script synopsis is not to give away all the key elements of your script, for free, to a total stranger who is hungry for new movie ideas. Spoiling the ending in the synopsis will not help to compel a reader to read the script. Consider this. If your synopsis gives the reader the main characters and the entire story, including the end, the only reason for the reader to read your script is to see how you handle dialogue. But dialogue is a minor part of any movie script. Premise, characters, and story are almost everything. So sending the reader a synopsis that includes the end is basically giving away your entire script to the reader. Why then would an overworked reader bother reading your actual script? Here’s a show business analogy. 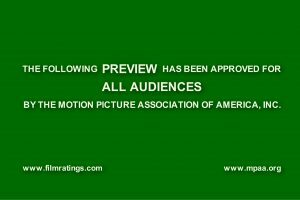 The purpose of any movie trailer is to compel the public to spend time and money to see the movie. That makes a trailer the movie marketing equivalent of a script synopsis. Does a movie trailer ever include the ending of the movie? Never! A trailer that spoiled the end would give people a reason not to spend time and money to see the movie. And a studio marketing executive who insisted that a movie trailer reveal the ending would be laughed at, and possibly fired. So don’t include the end of your screenplay in your synopsis. Instead, make your synopsis as compelling as possible without the ending. Prove to the reader with your few well-crafted paragraphs that your script has an intriguing premise, engaging characters, textbook story structure in the first two acts, rising conflict, stakes that are raised, and all that good screenwriting stuff. Any reader who thinks like that will ask you to send your script. And your synopsis will have done its job. 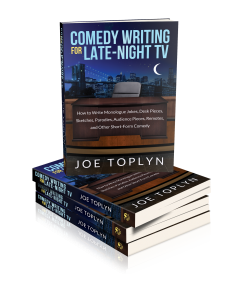 For more of my advice about writing get my book Comedy Writing for Late-Night TV.